Borrowing plot points from the Rick Moranis Dave Thomas film STRANGE BREW, ANOTHER WOLF COP has Officer Lou Garou going after an evil millionaire who looking to save the town by reopening the town's hockey rink/ brewery which he will use to produce Chicken Milk stout. Of course the stout is part of a plot by shape shifters to take control of the the town and the world. 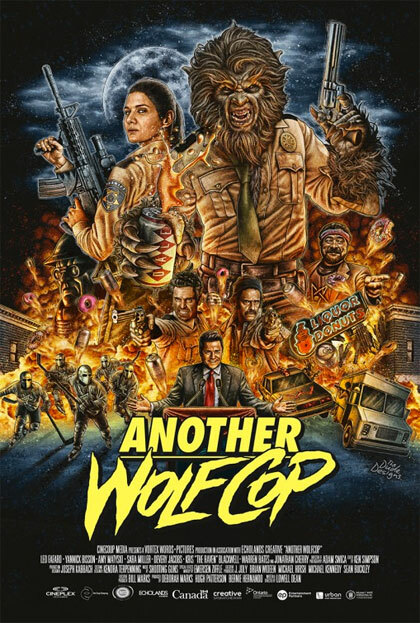 ANOTHER WOLF COP is that rare great sequel that takes what worked in the first film and amps it up making a sequel that improves on its predecessor. Walking the right line between serious and silly, the film and the characters treat what is happening as real while the filmmakers keep a light tone, the film puts a smile on your face from the first frame to the last. While the humor overwhelms any attempt at scares, the film remains firmly in the horror genre thanks to copious amounts of blood and guts which spill all over the place like a massacre at a hockey rink (which is something that happens here). The humor is more often than not spot on with a steady stream of belly laughs sprinkled all through the film. Be warned the film is decidedly, and wonderfully, not politically correct.Nothing is off limits or particularly high brow, which is fine since they all pretty much land as intended. 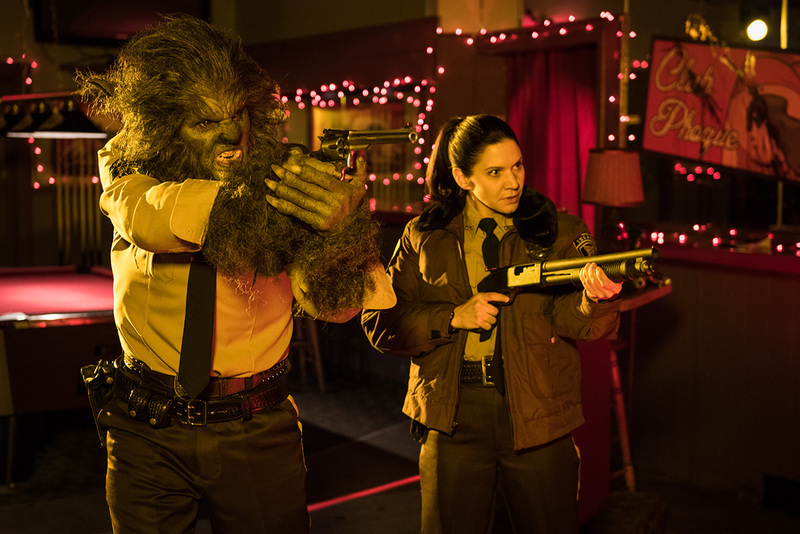 Like the first film this second helping of wolfy goodness is a great deal of fun. Where the first film was enjoyable and left you cautiously wanting more (After all how far can you take the joke?) this sequel leaves you laughing and thrilled that there will be a sequel since its clear the filmmakers know how to handle the property. I think his film maybe better than the first film since this time out the film doesn't need to have an origin story or set up characters, it can just get to the good stuff and go. And go it does tearing through it's story at breakneck speed. My only complaint is that the film itself moves so fast that it's over much too quickly, I would have liked more time with the characters. Then again it just makes me want a sequel all the more (I keep mentioning the sequel since it's promised in a mid credits sequence). I can't express how much fun the film is and how much you'll enjoy it. Everyone on screen, including director Kevin Smith as the mayor, seems to be having a blast and it carries over to the film. How good is the film? A very convincing argument could be made that the film is best cinematic sequel of the last few years. I could also see the film being held as the (exploitation) film of the year and ending up on some best of the year lists. It is a charming horror comedy that will delight fans of the first film and bring in more to the franchise.